Liminal states :: TWO wikis, saving democracy? It also sounds a lot like what we were thinking of with the Voter Suppression Wiki. In my launch post A wiki, saving democracy? I had commented on the value of a wiki repository for confirmed incidents of voter suppression; looks like they noticed that too. Their focus also overlaps withour goal of education, and the quality of their list of election protection and reform organizations shows how high their bar is. There’s no point in duplicating efforts in these areas; SourceWatch is the right place for these. So, after some discussions with the SourceWatch folks and others, we’re going to be focusing our energy on the third prong of Baratunde Thurston’s original call to action on Jack and Jill Politics: “learn, report, and ACT“. As we get close to election day, a couple of areas leap out where we can be particularly valuable. The first is in having “feet on the street” to investigate potential incidents as they’re reported. Very often, initial reports are fragmentary and ambiguous, and sometimes flat-out wrong; it’s useful to have somebody on the scene to get detailed information, and in a lot of situations grassroots energy may be able to supplement the efforts of more-highly-trained (but scarcer) election protection attorneys — as well as help out bloggers and other journalists. If we can get enough people involved, this could make a big difference. We also have a chance to help address one of the most difficult challenges on election day: getting word out to the community about new information and what actions they can take. Take the situation when a precinct is over-aggressively enforcing rules against political advertising at polling stations and illegally preventing people with buttons or t-shirts with a candidate’s name on them from voting. Yeah, okay, it’s illegal; lawsuits will be filed … on election day, though, the most important thing to do is let everybody know not to wear t-shirts and buttons to that polling place. Less dramatically, there’s a similar problem when judges extend the hours at a polling location: how do people find out about it? Something important to keep in mind is that many people — including those like seniors and lower-income voters who are most at risk of suppression — are not likely to be online, so it’s vital to reach them via radio, television, and word of mouth. Think of the wiki as one the hubs of a communication network that involves a tightly-connected core of people, communicating with a broad array of media outlets, voting rights organizations, and campaigns … surrounded by a broader network of feet on the street all over the country. One of the things that’s going to be key is having a large network across the country — and being able to communicate with them on election day. The first step to getting that in place is to go to make it easy for people to get involved if they’re interested. Especially for younger voters, a good way to do that is to set up on various social network sites. Speaking of which, we’ve got a Facebook page. More on that — and our presence on other social networks — soon. For now, please sign up as a fan, and check back from time to time. These plans are a lot more ambitious than our original ones, and it’s worth discussing the reasons for that. First of all, our launch went even better than we had hoped: almost 100 members of the wiki already, positive and very diverse coverage,** and a lot of interest and support from everybody we talked to. 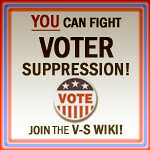 Secondly, there’s the Election Protection Wiki. With them taking care of the education and definitive repository, we’ve got more resources to focus on action; and it we’re able to work together and merge our networks, the whole is likely to be greater than the sum of the parts. As with all wiki projects, the Election Protection Wiki and the Voter Suppression Wiki rely on people getting involved and adding content. So please, check them out and get involved with one or the other (or even better, both!) and do your bit for saving democracy. * “election protection” includes voter suppression as well as other kinds of electoral fraud — voting machines, fraudulent registrations, etc. Posted by jon on Monday, October 6th, 2008, at 9:19 am, and filed under political, social sciences, Tales from the Net. I had seen the notice that the EP Wiki would be starting up, and later came across the existing V-S Wiki and wondered what was up. Wasn’t sure whether these two wikis knew about each other. Glad to see that you do (at least now! ), and that you’re working together. « Ask Facebook to de-friend Ted Ullyot!